InFocus IN80 goes bigger for less | What Hi-Fi? It's a DLP model, using DarkChip technology and Brilliant Color from Texas Instruments, and delivers a contrast ratio of 2500:1, boosted to an effective 7500:1 by the iris. It also has a maximum brightness of 1300 ANSI lumens, enabling it to deliver film-standard colour accuracy on screens up to 4m wide. 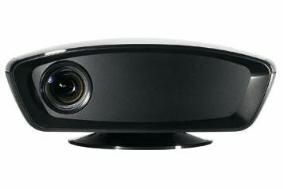 Pixelworks DNX 10-bit video precssing is used, and the projector offers two HDMI inputs. one of them on an M1 socket using an adapter supplied. You also get a 2m HDMI cable as standard. A wide range of adjustmen is available, and the IN80 can also store ISF Day and Night presets after cailbration. The IN80 will be available from September.